Like I started to say before, I’ve been increasingly indulgent lately. Cute W has long teased that I’m a Pussycat Mama as opposed to a Tiger Mother, but lately I’m even more of a soft touch. I have less fear, these days, that I will entirely ruin my children by allowing them to get away with something, which makes me more relaxed. Plus, I think they’re pretty awesome, which makes me happy to treat them instead of saying no. And I can see the finish line on this whole parenting-full-time-in-my-house thing, which makes me want to grab those little indulgent moments when I can. 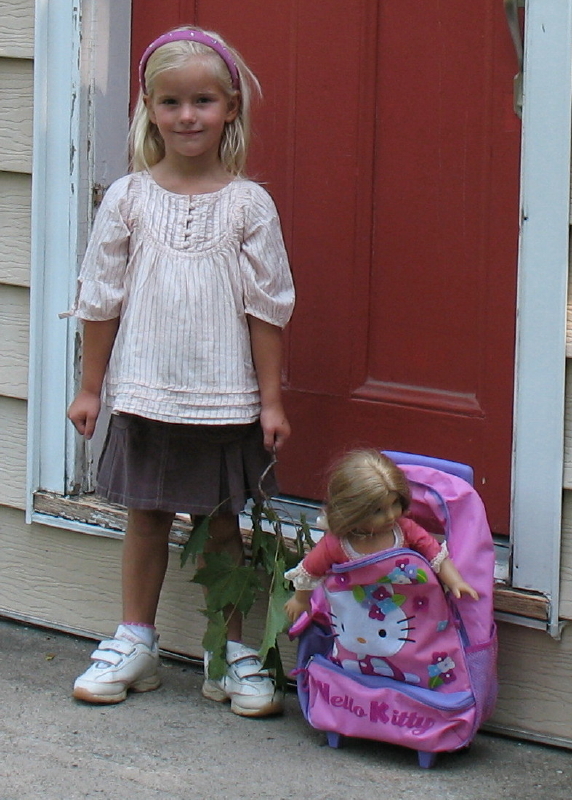 She’s been walking to school for a long time. Lately, I am a very eager and willing chauffeur for M. She can walk back and forth to school and other activities, and in theory, I think that she should. Walking is good for fitness and self-reliance and stress-reduction. And yet. I like driving her and picking her up. These are moments when she’s unguarded. She’s so preoccupied with whatever’s on her mind–whether it’s an upcoming test or a funny story about a friend–that she just straight-up opens her mouth and tells me stuff. Or, driving her and her friends? Yes, please! With a carpool full of girls I’m like Jane Goodall in the jungle. . . I can quietly observe and take note of the different girls’ personalities. For this year’s soccer carpool, another mom and I would laugh about how much we loved it when one particular girl was in the car, because she was always extremely gossipy and seemed constitutionally incapable of whispering. Plus, for quite a while, there, M wasn’t being particularly sociable. She always seems resistant to inviting friends over or even inviting friends to go out. These days, I’m thrilled when she has plans with friends, and I want to do what I can to facilitate some fun. So, whenever it’s possible, I will drop everything to give M–or M and her friends–a ride. If I were still in Early Motherhood Mode, I’d be worried about setting this precedent that my child’s time is more valuable than my own because I’ve been asked to jump in to help without adequate warning. But now that I’m an (ahem!) older mother, I think to myself that I have a limited number of opportunities to drive my kid. She is officially counting down to when she’ll get her learner’s permit and then be able to drive all on her own. And so, it seems, am I. You can’t actually fly upside down with your toes pointed without a bunch of practice. Meanwhile, with J, I am willingly overbooking her this summer, even if it means that we won’t get “our money’s worth” on all of her activities. I mentioned the activities she’s got lined up in a previous post. Mostly, J’s doing a ton of gymnastics practice this summer. Last school year, she went for the slightly-more-relaxed gymnastics team option, Xcel, mostly because she was concerned about getting all of her homework done during her first year of middle school. For the summer, she’s training with the more-intense Junior Olympics group. I think that part of her thinks that she could have handled the more intense schedule last year, plus she just wants to rack up a bunch of new skills over the summer, and she takes sports practice very seriously, so she wants to work out with the other super-intense girls. But we’re not exactly sure what’s going to happen in the fall. On the one hand, I think that 7th & 8th grade are not really significantly tougher academically than 6th grade–or at least they weren’t for M–so she could potentially handle the more intense gymnastics schedule, and I’m sure she could handle the less-intense gymnastics schedule. On the other hand, as it stands now, even the less-intense gymnastics schedule would make it virtually impossible to do other activities that J would like to do, like playing trumpet for stage band or trying out for a school sport (nope, our school district doesn’t have gymnastics as a school sport). She doesn’t have significant experience in any potential school sport, so the best time to get into something new will be this year, when 7th graders can play on what’s called “modified” teams where there are hardly any cuts. Years ago, J said that she expected that she wouldn’t do gymnastics all through high school. The truth is, you get to a point where either you are so amazingly awesome at gymnastics that it is your life, or despite all your efforts, you just can’t acquire the new (really tough) skills to make progress to the next level, and you’re discouraged and stuck. So if J thinks that she’s likely to quit in, say, 9th grade, she might be better off quitting quickly to try new things. But doing gymnastics is just about her favorite thing in the world. 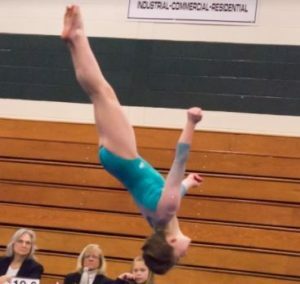 I think her biggest fear is that she’ll do gymnastics for another year or two or three, and then she’ll get stuck and want to quit, and by then it will feel too late to join any school sports, and she’ll be screwed. Or maybe that’s my big fear? I don’t know. But we’ve been looking into other things that she can do, either alongside or after gymnastics. We visited an acro-dance class that seemed to have potential, then fizzled. She dabbles in yoga. Lately she’s interested in volleyball. So when I found a volleyball camp for her to try, I happily plunked down a couple hundred dollars for the piece of mind it would give her if, this September, she decides that she wants to try out for the school team. Because I feel so bad for her! It’s such a tough decision, and whenever gymnastics is over it will be a tough transition, and I just want to give her options. And if that means paying for a camp that she might only attend two-thirds of the time, well, sign us up! I’d burn twenty-dollar bills if it would help her make a choice that she’ll feel good about. Meanwhile M’s had her own sports decisions to make. I’ll tell you about that next time.